When you spot one ant in your home, chances are that it is part of an entire colony. Rely on our company to detect and exterminate ant colonies in and outside of your home. Our skilled and knowledgeable professionals come to your home for ant control. We inspect and determine what types of ants are invading your home, and then we provide you with fire ant eradication, we remove carpenter ants, and eliminate any other species of ant from your property. Fire ants are an aggressive, stinging ant species that can be a serious health risk to your family and pets. They attack humans and pets that threaten or disturb their nests. Their bites are painful and can cause an allergic reaction. Rely on our exterminators for effective ant removal that protects your children and animals. Carpenter ants are another species that we commonly find infesting homes and properties. Construction sites are a primary environment for carpenter ants because the wood and other structural materials serve as food and habitat. These ants can cause a great deal of damage to wood. Reach out to our professionals to check trees and wood around your property for a carpenter ant colony. Seeing ants scurrying around your property is certainly a cause for concern, but flying ants pose a threat to people and property. Seeing flying ants around your house in the winter months means there is a nest nearby, likely somewhere in or near your house. 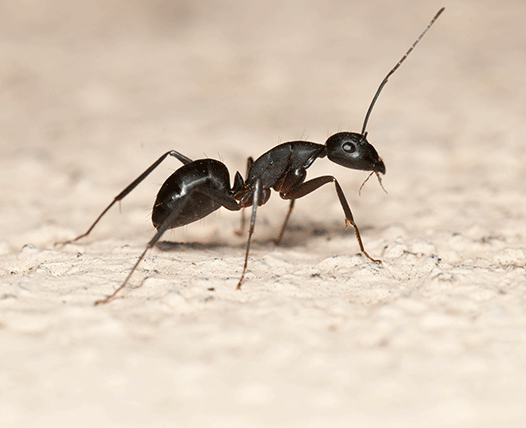 To ensure that carpenter ants do not damage your home, ask our ant exterminator to find and eliminate the nest. Since these pests prefer areas with wood and moisture, they often can be found nesting under the porch, near window sills, in a bathroom, or in a cabinet under the sink. To eliminate ants that are inside your house, we seal off areas that they might be using to gain access indoors. Our professionals use proven products and methods to eradicate flying ants from your home and property. Our licensed and bonded exterminators treat your ant infestation with specialized and highly effective insecticides. We administer our pest treatment into voids and crevices and ensure that no spot gets missed. Part of our strategy is to target the ant queen and extinguish any ant mounds in your yard. Our technicians make sure that ants have no way to get inside your home or business. Ask us about our financing options for ant removal. Professional ant control begins with a deep understanding about what attracts ants to your home. Food that is spilled or left out—even food for your pet—serves as an invitation to ants. Our professionals identify the type of ant, its food sources, and its nests. Then, we work with you for ant treatment. When you understand what attracts ants, there are many things you can do to discourage their presence. Setting traps or spraying around the kitchen may get rid of a few ants, but it does not provide a permanent solution. Count on our exterminators to identify the type of ant and come up with tried-and-true solutions. There are things that you can do and we can do to eliminate ants from your home and property. We are as concerned about the environment as you are and use products and practices that provide you with ant extermination that keeps your family and pets safe. With our extensive experience in pest control, we make use of safe and effective products, such as ant fumigation, that eliminate the problem. Contact us today so we can begin an effective program to eliminate ants from your property. We service homes and businesses in Miami, Miami Beach, Homestead, Coral Gables, and Key Biscayne, Florida, as well as the surrounding areas.